Ipanema Latin Band plays a massive repertoire of the most popular Latin hits, including but not limited to salsa, meringue, bossa nova, cha-cha, bolero and cumbia. The expert musicians in the band are well-versed with their instruments, having decades of experience in the field. They can not only add charm and grace to your events with their skills but can also make your events most memorable and fun-filled. With each musician's dexterity and harmonising, Ipanema Latin Band ensures your functions will be successful and unforgettable. With our glorious Latino atmosphere, we guarantee your guests will be enchanted and they will enjoy every moment of the event. Gonzalo Porta born in Australia moves to his family's homeland of Uruguay at a young age. His remarkable ability established his music career from the age of 13 and lead to massive success in Uruguay and throughout South America such as Bolivia, Argentina, Brasil and Chile. His success lead to have number 1 hits with groups like Monterrojo, La 424, Karibitos con K, Zanatta y L'Autentica. Gonzalo began singing and recording professionally at such a young age, that he was affectionately known as Gonzalito (little Gonzalo) in the Uruguayan music scene, a name that has stuck to this day. Due to his reputation, Gonzalo was also part of the Film 'Aparte', a remarkable film aiming at the Uruguayan population. Now with eight gold records to his name, this acclaimed international singer/songwriter return to Australia in 2006 keen to continue his successful music career. Gonzalo is currently recording his first solo album called Equilibrio. This album is to be released in Uruguay, Argentina, Chile, Miami and Australia at the end of this year. 1. Sydney Salsa all Stars a 10 piece authentic Salsa band. This band is comparable to the rich and energetic Salsa movement that has been sweeping the Latino dance floors of New York City, Miami Beach, Colombia, Puerto Rico and Europe for years. 'Salsa dura pal bailador, a Gozar!'. 2. 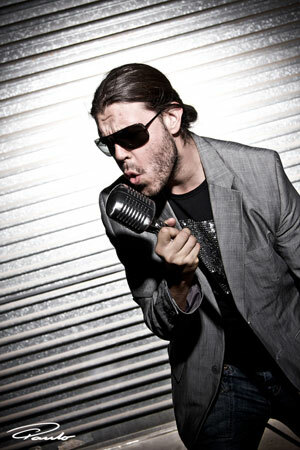 Gonzalo Porta as a solo artist brings a combination of latin rhythms such as pop,merengue,salsa,cumbia and samba. 3. 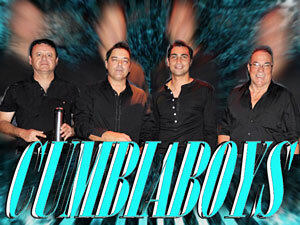 Cumbia Boys is a band that plays all Latin classic hits making this band ideal for RSL clubs. 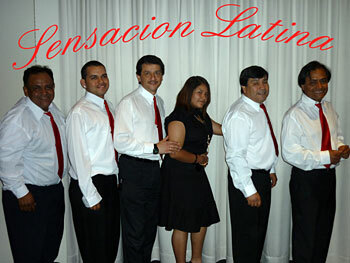 Are one of Sydney's most experienced and versatile Latin Bands. Previously known as 'Bamboleo' they have consistently been packing latin dance venues since their inception in 1998. Keeping up with the changing music market and demands of their audience they have also worked under the names 'MoZaike' and 'Sydney Sound Machine'. The band has held longterm residences in several well known venues including VIVAZ Restaurant Nightclub at The Rocks, La Vista Latin NiteClub at Petersham RSL and The Portugal Madeira Club in Marrickville. Other notable residencies include: The Star City Casino, Amazones Niteclub/Restaurant Parramatta, The Stock Exchange Hotel Sydney CBD and The Millennium Hotel in Potts Point. 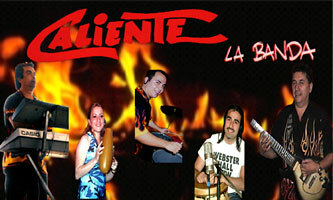 The band performs a broad range of Latin Rhythms including: Salsa, Bachata, Rumba, Merengue, Cha Cha and Cumbia. To keep things interesting Salsaton, Cumbiaton and a dose of Reggaeton are thrown into the mix occasionally. 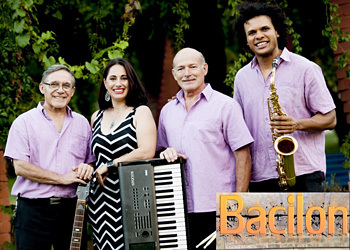 Bacilon is a 4 piece band which plays an enticing mix of Modern Latin Grooves and Traditional Rhythms. If you love Salsa, enjoy Merengue and Cha Cha Cha, are Mad about Mambo or get excited when you hear LATIN!! 'Then you'll Love' Bacilon. 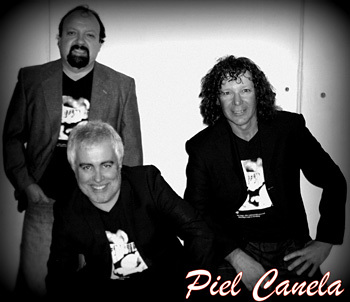 Piel Canela is a 4 piece power Latin band, formerly known as Latin Breeze. With more than 15 years of experience in the entertainment industry. 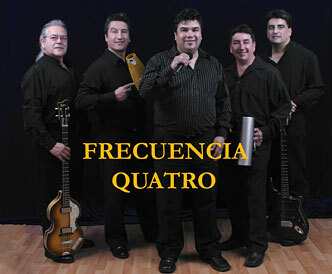 Being resident band in several clubs for many years makes this Latin group very well known in the circuit and among the Latin music followers. Playing all the old and new favorites Latin tunes with authentic South American chemistry. Powerful sound and great vocals with the addition of piano,timbals,congas and guitar, make Piel Canela the perfect combination for every Latin night. BOMBA is the freshest sound to hit the Sydney Latin scene!!! Originally under the guise of another name, BOMBA has re-grouped and is back hotter than ever! BOMBA has played in all the major Latin Clubs in Sydney and has performed as feature artists in various festivals such as DARLING HARBOUR FIESTA FESTIVAL, MANLY JAZZ FESTIVAL, PERUVIAN FESTIVAL and many more private and corporate events. Venues such as VIVAZ LATIN NIGHTCLUB and CLUB MARCONI regularly feature BOMBA as an act as BOMBA is well known for their ability to make everyone dance til they drop! So if you're looking for a band that caters for all audiences, this multi-talented six piece band is the one you need! 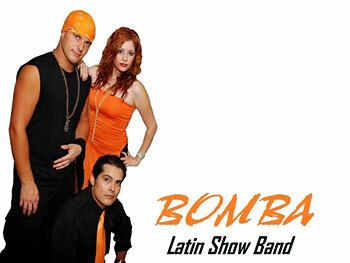 From Club gigs to Corporate and Private events to Weddings, BOMBA does it all and will leave you wanting more. This exciting 5 piece Latin Band share a common love of Latin music and the band has quickly established itself as one of the favourites amongst the Latin American Community. The band consists of Keyboards, Bass, Drums (with percussion), Guitar & lead Vocals with backing harmonies from other band members. This band plays many of your favourite Rock & Roll & 70's classics. The latest Latin band sensation to hit the block! With a collective stage experience of over 30 years, a bangin' rhythm section, and three energetic and show stopping vocalists. Playing all the rhythms from Latin America and beyond such as SALSA, CUMBIA REGGAETON, MERENGUE, R'N'B, CLASSIC '70'S & 80'S FUNK, and all the hits of today. Catering to all occasions and events, including corporate events, weddings, birthdays, and incorporating DJ's and floorshows to suit all your needs. 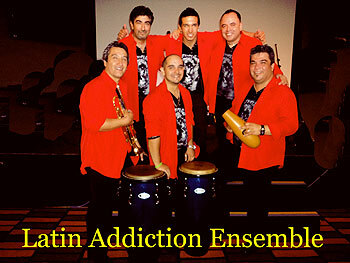 LATIN ADDICTION IS SURE TO TURN ANY FUNCTION INTO THE FIESTA OF THE YEAR!!! Popular Latin Cabaret Performer & 3 Piece Band who specialise in International Dancing Music including Latin American evergreens, songs in Greek, Portuguese, Spanish, Italian & English. Rock & Roll, 60's, Lambadas and favourite standards are a highlight to the evening. 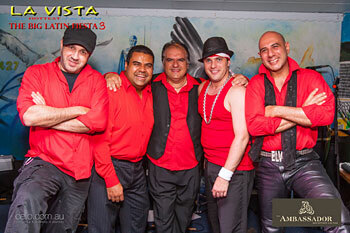 Mambo Asi is a Sydney based Latin music group that has been in existence since January 2001. 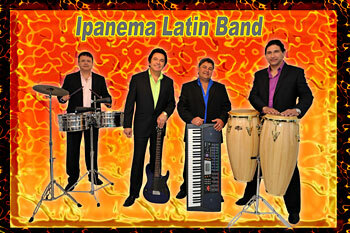 This four piece band will make you dance till you drop with music from all the corners of Latin America. Mambo Asi has been a fixture at Star city (Rio Carnivale Room) for almost the past two years. 3 - 5 piece band which plays a wonderful blend of Latin Rhythms that will have you dancing the night away. Their repertoire consists of all styles of Latin Amercian music including all the modern sounds of Ricky Martin and Gloria Estefan. 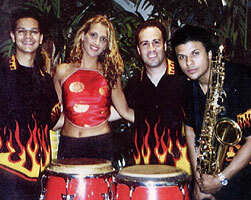 Club Havana Band is the most successful Latin outfit in Australia. In nine years they have performed at all the major festivals and nightclubs throughout the country as well as numerous appearances on National TV & Radio. In the last few years they have added international performances to their name, making them Australia's premiere Salsa band. 'la BOMBA de Sydney' as the are affectionally called by their ever increasing fan base is the Cuban sound of Sydney, playing Timba, Salsa, Son, Songo, Cumbia, Cha cha cha and Boleros. 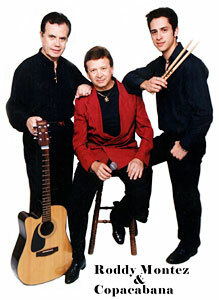 They are particularly known for their original repertoire. 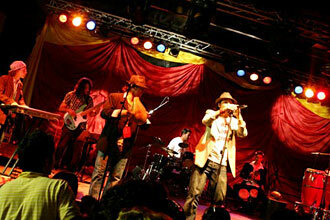 In 2006 Lorenzo Le-Feuvre (director and founder of the band) invited Carlos Velazquez, formally of Australian Idol fame to sing & collaborate with 'la BOMBA de Sydney'. Finally the Salsa Scene's most successful outfit had perhaps found the most talented Latino singer in Australia as part of its ranks.